Kale is so fabulous for you, and I eat it sauteed, in soup or in casseroles all the time. But to be honest, kale salad has kind of intimidated me. Kale can be kind of tough and it’s just a lot of chewing, you know? I decided to face my fears and I took on a kale salad the other day. I’ve done some research and it seems kale salad is much better if you massage the dressing into the leaves. Yes, I said massage. And really, how could I say no to a recipe that involves massaging food? Truly, this recipe is really simple, it’s all about technique. And another great thing about this salad? It’s doesn’t really wilt. So you can actually make it in the afternoon or even morning and it’ll keep all day. And the finished product is absolutely delicious, full of healthful ingredients. I used cucumber and peppers in this batch, but this recipe is super versatile…you could add avocado, chickpeas, sunflower seeds, shredded carrots….your imagination is your limit. Place the garlic, lemon juice, olive oil, salt and pepper into a food processor and pulse to emulsify - set aside. 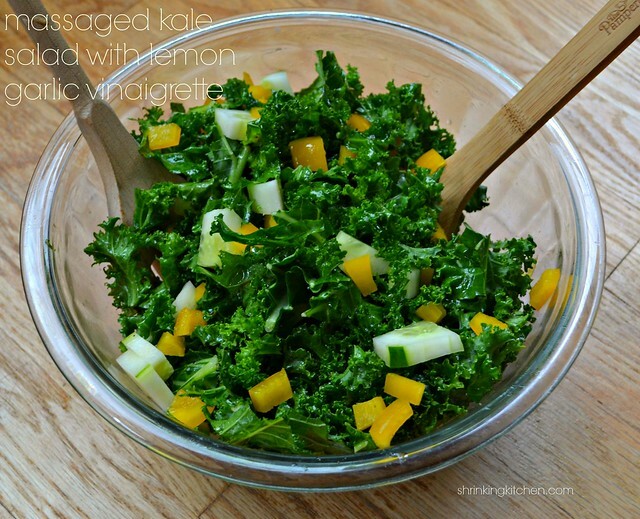 Throw all of the kale into a large bowl and pour the vinaigrette over the top. Using clean hands, gently give your kale a vinaigrette massage. Make sure you get every piece (or at least try to!). Add the rest of your vegetables and gently toss to combine. Allow the salad to rest for at least 10 minutes. Test seasoning before serving, add more salt and pepper if needed.